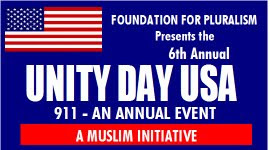 We are pleased to invite you to the Unity Day USA; a purposeful event to bring Americans together. 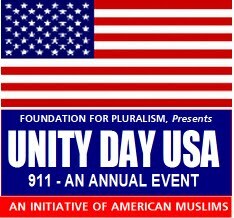 The idea for Unity Day USA was first conceived on Tuesday, September 11, 2001 and took its current form on Sunday, September 11, 2005. It is an initiative to come together to stand up for the safety, security and cohesiveness of America. Our civic leaders including Mayors, Council members, State representatives, Senators, Congresspersons and other officials will honor us with their presence. Each Mayor at the event will give a one minute speech to share their thoughts about co-existence and promoting social cohesion in their respective cities. Additionally, our men and women in uniform including police and fire chiefs will be honored for their outstanding service to our nation. Leaders from various faith communities will share a few words of wisdom from their respective scriptures, beliefs or oral traditions. Unity Day USA is about re-affirming our faith in the goodness in humanity, and the longing for harmony and co-existence. The traditions include but are not limited to Native American, Atheist, Baha’i, Buddhist, Christian, Earth-traditions, Hindu, Muslim, Jain, Jewish, Sikh, Wicca and Zoroastrians; thus it is an all inclusive event. It is an experience to feel a sense of unity with fellow Americans that brings forth a feeling of coming home to where we drop all of our identities and to be united together as an American family. As Americans we uphold, protect, defend and celebrate the values enshrined in our constitution. Our faiths reinforce the idea of one nation with liberty and justice for all. 1. Please mark your calendar for Sunday, September 12, 2010 between 5:30 PM and 7:30 PM, and send a confirmation of your intent to attend with your names to: confirmattendance@gmail.com. 3. 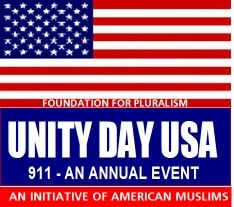 If you wish your organization and place of worship to be listed as participating organization, please send the name and URL of your organizations to: unitydayusa@gmail.com, it will be listed on our website. We have had 90 organizations participate in our previous events. A few selected comments from the fist event. The general public including you. Are you in the group? If not, please join. No matter what sub-identity we prefix to it, we are all Americans. I request each one of you to be who you are, and be proud of it, it is what you believe and it works for you. What does it take to build orderly societies? What does it take for you, me and others to feel safe and live in peace? We have to consciously create institutions and systems that will become a catalyst to a positive change and bring about cohesive functioning of the society. It is our duty to keep law and order and faithfully guard the safety of every citizen. As an individual, I cannot be safe if the people around me aren’t, it is in my interest to seek peace for all of us. Most of these church's are liberal church's...so screw them. I'm really disappointed to that Catholic, Baptist, Episcopal, Lutheran, and Mormon religions are not represented at this event. It is an honor, as always to be blessed with the opportunity to express our love and appreciation for Texas' diverse community. Thank you, Mike Ghouse, for continuing to offer all of us in North Texas the chance to stand for religious tolerance in this elegant tribute to unity and love of our nation of the United States of America! By demonstrating that we refuse to engage in the blind hatred/bigotry of burning Korans or Jihad, we are unifying our voices in defiance of those who sought to divide our great country on 9/11. We are standing up for freedom of religion for all. 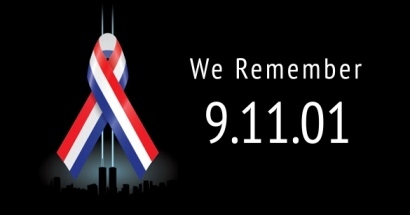 I encourage everyone to take the time to come out and remember the heroes and victims of that fateful day. 3. Thanksgiving Celebrations - Nov.